Fire hazards are a concern for every facility. We offer a wide variety of fire safety labels to help you and your company prevent fire hazards and limit fire damage when hazards occur. Sometimes mere seconds is all it takes for a fire to grow out of control and our labels may shave those precious seconds away by increasing fire awareness.These products are smaller than our wall and floor signs, but are still adhesive backed and resist chemicals, water, fading, and abrasion. 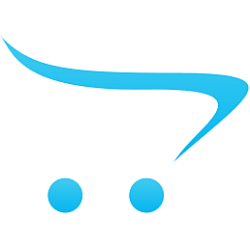 The texts and/or symbols are printed with a high, 300 dpi resolution and thermal transfer technology for increased colorfastness. Effectively label fire extinguishers in areas that are not necessarily designated fire extinguishe.. Allow emergency crews to more easily identify locations of fire hoses to speed up the extinguishin.. Sends a strong message that smoking is restricted nearby. Great for areas that have inreased fire .. Sends an absolutely mandated message that smoking is restricted in the area. Ideal for use in area..
Mark areas that are appropriate for smoking during breaks. 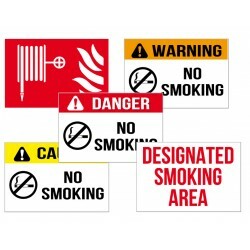 Distinguishing smoking break areas help..
Help keep evacuation efforts organized and panic-free by clearly indicating the assembly area duri..
Add visibility to the location of the fire alarm to help ensure that it gets used as fast as possi.. Notify personnel of fire doors and instruct them to keep them close for safety. 3 size optio..
Add visibility to the location of fire extinguishers to ensure quick identification and use during..
Clearly label extinguisher locations to ensure quick identification and use during fire hazards an.. Effectively labels your fire hoses for improved identitability. 3 size options available U..
Labels fire hose containers effectively with a standardized symbol. 3 size options available..
A simple, effective way to label a substance as flammable. This label helps reduce dangerous fire ..
Open flames can be more hazardous in some areas more than others. Keep employees aware of particul..